Home is where the heart is. Apart from being the ideal place to unwind after a long day at work, your home is also the biggest financial investment of your life. So, it is natural to go out of the way to protect your property and keep it safe and secure from intruders. In today’s digital age, homeowners are blessed with a plethora of fancy gadgets to smarten their homes and keep them burglar proof. 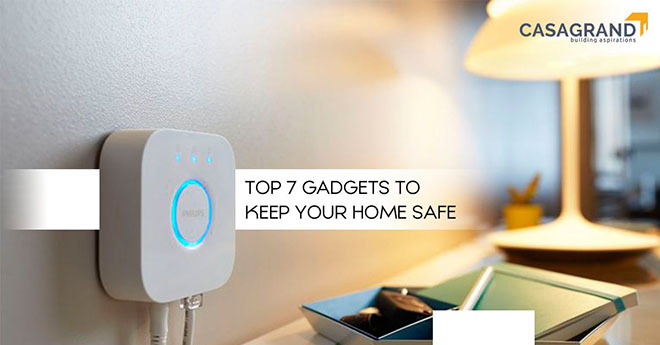 Let’s take a look at the top seven most useful gadgets that are guaranteed to keep your home safe and give you complete peace of mind. Security cameras are the go-to gadgets when it comes to smartening your home. These cameras are getting smaller and smarter by the day with additional importance given to style and design. You can either mount these cameras on the wall or place them on a side table to keep a close look at what is happening in your home. You can also opt for cameras with facial recognition features to know who is entering or exiting your home. Gone are the days when the traditional peephole was the only way you can view who is at your doorstep. With a digital peephole, you can scan your doorstep through an LCD screen mounted near your door. This gadget has the added advantage of presenting you with the view of the entire hallway instead of the constrained view of a traditional peephole. Additionally, you can view visitors of different heights due to the wider view you get. Motion sensors are the perfect solution for home owners who want to keep a close tab on the security of their home but want to maintain the privacy of the people living in it. These gadgets can sense any movement and will immediately send a notification to your smartphone or activate an alarm. You can turn these sensors on during the late hours when the only movement in your living room or stairway will be those of intruders. Burglars and dogs never go hand-in-hand. You can keep your property at bay with this barking dog alarms which operate on microwave and radar technology. The alarm gets activated with a loud and very realistic noise of a barking dog that is guaranteed to ward off any intruder. You can choose from a set of pre-programmed barking sounds as per your preference. Your lawn and backyard are also integral parts of your home. They are the first points of intrusion by a burglar so guarding these areas should be your top priority. Dot the blind spots of your home with trendy lawn cameras that come in various styles and designs. These gadgets don’t even look like cameras making it even easier to trick trespassers and thieves. This new-age gadget gives outsiders the misleading illusion of the TV being on at your home. It gives out a series of LED images and projects these lights and colours on the walls and windows of your home. An intruder can easily mistake these lights for late night television viewing and walk away instead of breaking in and entering. You can plug in this gadget at night, or when you are running errands, and set it off with a timer. Digital smart locks are taking the safety and security world by storm. These fancy locks can be installed on your main door and are compatible with all leading smartphones and tablets. You can take a look at who is at your doorstep through the pre-installed camera and unlock the door with your phone, eliminating the need to walk up to your door every time. Additionally, these locks can be opened with your fingerprint or with a security code that can be shared only with your family members. With such amazing gadgets available in the market, keeping your home safe and secure is now easier than before. Ensure your home is guarded with our detailed home safety and security guide. If you are planning to invest in a property, head out to Casagrand for luxurious homes at affordable prices. Make sure you go through our helpful guide of taxes and duties payable while buying a home for a hassle-free experience.